I am back today with Card 2 for Elle’s Stamp Trio Challenge. I am having such fun with this challenge. (See this post for my first card in this series). For Card 2, I moved away completely from the baby/family theme. 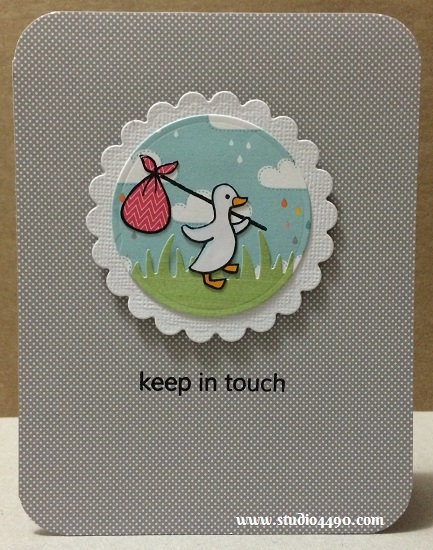 When I had first seen the Hello Baby stamp set from Lawn Fawn it crossed my mind that the little duckling would look adorable carrying a swag and that it would make such a cute “Bon Voyage” style card. Immediately, I knew that the card would have the centre circle but I had planned to layer it on a panel of many different complementary colours before attaching it to a white card. Unfortunately when I stamped the sentiment on this panel, it didn’t stamp clearly and I didn’t line it up perfectly when I tried to re-stamp it. Instead of trying to re-make the panel, I decided to go super simple and just use the grey and white polka dot background to finish the card. I really like how it ended up – simple but cute and it really could be used for anybody. Materials Used: Stamps – Hello Baby (Lawn Fawn), A Little Sentimental (Clearly Besotted), Pandamonium (Mama Elephant); Dies – Grassy Border (Lawn Fawn), Standard Circles Small (Spellbinders); Designer Papers – Hello Sunshine (Lawn Fawn) and Copic Markers. I know I will be returning to this design because I still have a few more things I want to try (such as re-creating the panel I mentioned above; adding ribbon; adding sequins/enamel dots). In the meantime, I am off to create card three. How brilliant you are to design this traveling duckling, carrying his little swag bag, as he quacks his way along his journey! Totally sweet! Yes, all kinds of possibilities with a sentiment change, for sure! Card #2 of the trio is as awesome as the first!! As for the inking mishap, oh gosh…frustrating! Then again, welcome to my world, where ‘smudge-fests’ are occurring far too often! Sometimes I stamp ‘too hard’ (squish them only to my paper to be sure they transfer) and I wind up with ‘fat’ blurred images; then in an effort to rectify the situation, I try again, with a lighter touch, only to have faded or incomplete images. Maybe some proper acrylic blocks (with grid lines!!) would help….or maybe focusing better *grin*!! Thanks, C! I was so chuffed when I saw how the duckling looked carrying his swag. It was just how I imagined it to be. Yeah, stamping mishaps are annoying. Sometimes I just chuck it out and start again. Other times I put it aside for another day. Some can easily be fixed. Have you tried stamping on a mouse mat? Sometimes you just need a little “give”. Put the mouse mat down, then your paper and stamp away. You might find it helps fix your wobbles. 🙂 hugs! This is very clever! I really like the idea of the traveling ducky. It’s so sweet, and completely unexpected. Thanks, Elle! As soon as I saw it, I knew I wanted to go down that path. LF has the cutest stamps.